This poorly focussed photo shows our instructor about to start a fire by literally "rubbing two sticks together". In this case, though, it worked and even I was able to do it. This technique requires a dry piece of bamboo. Thin shavings are taken from the outside of the bamboo to serve as tinder. 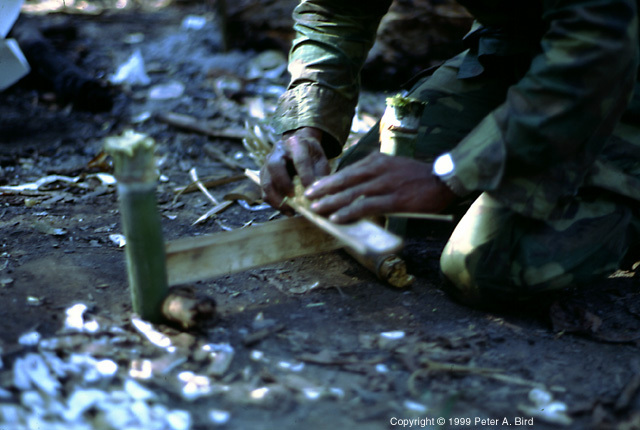 The bamboo is split as shown to get two pieces about a foot long. One, which has a sharp edge, is staked to the ground, while the other has a notch cut in it which fits the sharp edge and is just deep enough to penetrate the wall. A small ball of tinder is held in place over the hole formed by the notch and upper piece is pressed down hard against the sharp edge of the stationary piece and moved back and forth rapidly. In just a few strokes, the tinder starts to smolder.